Just a short while ago I was having one of those blogger writing block moments. Then I remembered I was meeting three girlfriends for lunch and began to reflect on all the reasons moms need our own friendships whether the kids are already post-college, at universities, in high school like mine are, or even haven't finished grade school yet. As a matter of fact why do female friendships -- whether you're single or married with or without children -- matter so much? That's the inspiration for this post. That and the review I did on the New York Times Bestseller The Girls from Ames. Actually, I've been thinking a lot about that book the last few days in light of the sad news that the author of this title, Wall Street Journal Columnist Jeffrey Zaslow -- married and with daughters of his own -- died in a fatal auto accident last week. If you haven't read this amazing book about the power of deep friendships between women you might want to put this on your reading list. Each of us has different groups of friends that we know socially and through our children and family. Most also have various meaningful feminine relationships with whom we have bonded with through our work as female professionals, mom bloggers and/or volunteering in the community. For example, I'm active in a women's entrepreneur community affiliated with Martha Stewart Living Omnimedia called Dreamers into Doers. 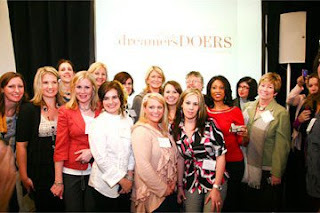 In fact, I was privileged to be among the 80 or so female business owners from around the U.S. hosted by Martha for a professional development conference in New York City last year. 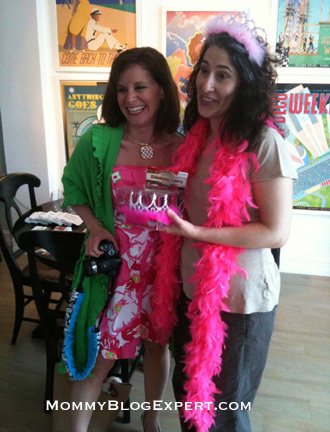 Then there was SheCon in Miami Beach where I not only was a speaker, I hung out with and got to know other prominent working moms like social media pioneer Aliza Sherman and Just Precious mommy blogger Julie Pron. Let's not forget BlogHer, either -- definitely the mother of all blogging conferences for women. There's way more gal friends to see and catch up with (and new ones to meet) at that annual blogging event than there is time for. I absolutely love attending as many women's and blogging conferences and other events as possible -- like many of you do. This explains why MBE has a dedicated page on this blog featuring the largest free calendar list of upcoming women and mom blog conferences complete with links available anywhere online. Definitely check it out if you haven't already. These business trips and outings provide an essential social outlet away from my other job as a work at home mom WAHM. Indisputably this time away from my family has its rewards, contributing to both my personal and professional growth not only as a woman, but as a wife and mother. I have a feeling that the experiences of many of you are similar. Think about it. Friends are a given when you're a child. But when you're a grownup mom of children with friends of their own and all the fun and drama that go along with it, you might get so immersed in family life that you inadvertently neglect close adult womens' friendships. Those thoughts hit me hard just after catching up with three close friends here in L.A. the other day. For sure, our lives are insanely busy. In my case there's a total of 12 kids between the four of us -- sons and daughters at every stage of development from elementary school through post-college age. I suppose it shouldn't surprise me that we're only able to manage going out for lunch together once or twice a year. Ironically, we all wish it were a whole lot more often than that since we have tight relationships and have all lived in the same neighborhood for over 10 years. Yet, this brief ladies schmooze date with some good female friends is a reminder, a lesson about living life to its fullest from the feminine perspective. A concept that's worth repeating. We women do indeed love and need our hubbies, significant others, and children, as well as independent interests and hobbies outside the scope of our families. But there's something else we need too. We big girls need each other to thrive and nurture our multifaceted souls, enriching each of our lives in many unique and special ways. That's the message of Zaslow's Girls from Ames, too, and my latest friends encounter reconfirms that ideal. As females how do you maintain your adult friendships with other women? What are some of the ways these relationships enhance your life whether or not you are married and/or have children? Why do woman to woman friendships mean so much to you?